This Hinkley Dakota single wall light with seeded glass shade in polished antique nickel finish features rustic chic, with a sleek, elegant design and modern timeless look. Featuring a detailed cameo wall mount, horizontal arm and upright candle style light, with tall clear seeded storm glass cylinder shade. A stunning wall light fitting of impeccable style, quality and detail. The ideal addition to any dining room, bedroom, hallway or living room wall. There are coordinated fittings available in the Dakota rage that includes eight and six light chandeliers and and a three-light hanging lantern; please see below. This timeless light is supplied by Elstead Lighting and designed in the USA by Hinkley, founded in 1922 in Cleveland, Ohio. 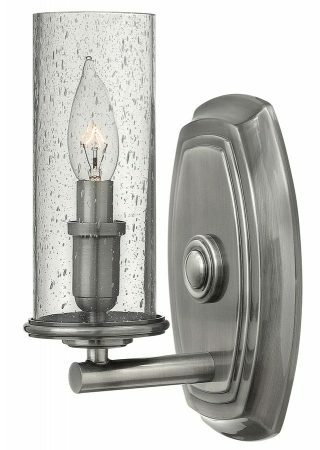 They have transformed from a small outdoor lantern company to a global brand intent on bringing you the best in style, quality and value designs like the Dakota single wall light with seeded glass shade in polished antique nickel finish featured here.